A reader recently asked me about some common, yet undeniably annoying skin concerns. I was happy to give her my two cents and even enlisted the help of renowned dermatologist, Dr. Heather Woolery-Lloyd and celebrity makeup artist, Carola Gonzales. Here's what she asked: "My skin is uber-dry, and recently I've been having problems on my face and neck with patches of dry skin. My skin color/ tone is also very uneven, and even though I am 26, my skin still bares the scars of teenage acne. I am in desperate need of a recommendation for something that will smooth my skin, heal away all the scars, improve the tone, and moisturize it and I wondered if you had any good recommendations? -Get Mederma Scar Cream Plus SPF 30. I had a dark scar underneath my lip and regularly applied Mederma on it and it's basically disappeared. Make sure you get it with SPF or use SPF regularly because you don't want the scars/skin to darken since they're already a different shade than the rest of your face. It really works well. Or try Clinique Even Better Clinical Dark Spot Corrector and/or Clinique Even Better Skin Tone Corrector which also addresses acne scarring. Celebrity makeup artist, Carola Gonzales (who works with The Office's Mindy Kaling and Kerry Washington) says she loves these products and has noticed a big difference in her own skin after using them. Drugstore Brands-I love Neutrogena cleansers. 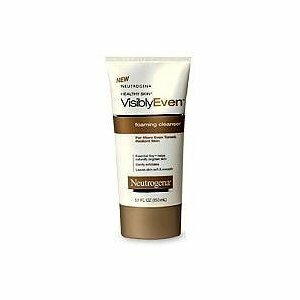 For uneven skin tone try Neutrogena Healthy Skin Visibly Even Foaming Cleanser. It works really well but avoid using it daily if you have dry skin. It's gentle and mild on the skin but does contain exfoliating beads. Too much exfoliating will strip your skin of its oils and makes it feel even more rough and dry. I'd recommend something like Neutrogena Deep Clean Cream Cleanser for daily use. It's removes dead surface skin that can roughen your complexion and it doesn't make your skin feel tight and itchy. On a side note their hand cream is my absolute obsession and truly works miracles on super dry skin. 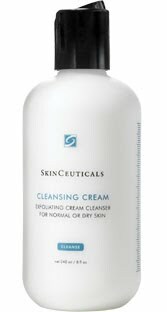 Department Store Brands-I also really like Skinceuticals Cleansing Cream. The brand is highly recommended by many dermatologists (and me) and they have a full range of products for every skin issue. I really like this brand as a whole and their face washes in particular really do what they say they're going to do. Other options: I love Estee Lauder products. I really trust the brand. Estee Lauder's Perfectly Clean Splash Away Foaming Cleanser feels moisturizing on dry skin. It's super creamy and very gentle. They've been in the beauty business forever and their skincare line is tried and tested amazing. A good toner will remove the dirt and impurities from your skin that a cleanser can't get to. I always use it after I wash my face and before I put moisturizer on. I highly recommend adding a toner to your nightly beauty regimen. Clinique Mild Clarifying Lotion is a great option. It's effective and affordable. I also like Estee Lauder's Soft Clean Silky Hydrating Lotion but it's definitely more pricey. I can't get enough of Fresh Appleseed Brightening Exfoliant. My complexion has definitely improved because of it. I only use it once a week because I don’t want to over scrub my already dry face. Limit use to once a week or dilute it with water if you have super dry skin. Also apply the scrub onto dry skin first and then wash it off. It's more effective that way. So put it on before you jump in the shower and then wash it off. Or try Clinique 7 Day Scrub Cream Rinse-Off Formula, a gentle scrub and that's great for dry skin. 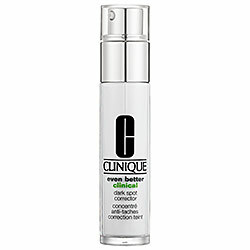 Try Clinque Even Better Skin Tone Correcting Moisturizer SPF 20. It's effective for uneven skin tones and will nourish your skin. To make your moisturizer as effective as possible, apply it immediately after you jump out of the shower or wash your face. Slightly damp skin locks in moisture and helps prolong the effects of your moisturizer. So with your face cream and body lotion (if you use it) apply it as soon as you get out of the shower. You can even use a moisture-locking spray like Evian Mineral Water Spray to replicate the effect. Was any of this information helpful to you? Let me know and let me know your other beauty concerns! Thanks to my loyal Beauty Buff reader for her important and extremely relatable questions!